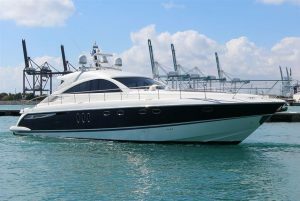 The motivated seller of this pre-owned 62' Fairline says "trades considered!" : Atlantic Yacht & Ship, Inc. Along with the recent price reduction, Stephen Faraldo says “trades considered” on his pre-owned 62′ Fairline yacht for sale in Florida! In the first place, this sleek used 62′ Fairline was launched in 2007. In addition, she is currently located in Lighthouse Point, Florida. As can be seen, she has been professionally maintained by a captain which means she is in exceptional condition. When combined with a new bottom job in August 2016 she is ready to go! Overall, this powerful used 62′ Fairline yacht has lots of upgrades and features that make her special. You will love her updated Garmin 7215 electronics package. After all, this is only her second owner since new. Furthermore, the cockpit air conditioning will have you comfortable while cruising the tropical weather. Additionally, the hard top allows you to enjoy some shade when you have had too much sun. Her newly-installed teak decks are beautiful and comfortable. Together with her recently upgraded Caterpiller C-18 diesel engines you have everything you need! For more information on this beautiful used 62′ Fairline yacht for sale be sure to contact Stephen Faraldo today!